Food Costs > How Much Does a Fruit Tray Cost? How Much Does a Fruit Tray Cost? Fruit trays are commonly found in the produce section at your local grocery store. The costs will depend on the fruit on the tray, the amount of fruit needed, the presentation, and where it’s being purchased. The prepackaged grocery store variety commonly found in the produce section can start as little as $10 to $30, while an over-the-top catered arrangement can run you in the hundreds. Those who want to purchase from a grocery store should plan on spending around $2 to $3 per person, and experts recommend that the average person will eat a half cup per serving. For instance, Publix sells a variety of fruit trays in its produce section, with these platters ranging anywhere from $25 to as much as $50. A tray that feeds up to 12, for instance, will cost $25, while a platter that serves up to 20 can cost $38. A fruit arrangement from Edible Arrangements can cost anywhere from $25 to $300, depending on the factors mentioned prior. Chick-fil-A offers a small fruit tray for about $26 and a larger fruit tray for $54 if you pick it up at a local location. Of course, you can plan on paying extra if you want to have your fruit platter catered or have your fruit arranged by a professional. Like florists, there are creative hands out there that can make your fruit tray into a masterpiece, but this comes at a price. Also, fruit that is imported, out of season, or uncommon will have a higher cost. Hiring a professional company to design a fruit tray can cost two to three times the amount. Unlike the grocery store, these companies can design your fruit tray into a flower bouquet, etc. Adding vegetables and cheese can increase the costs. A fruit tray often purchased at a grocery store will be placed on a throwaway fruit platter tray. Common fruits will be divided and will include grapes, strawberries, pineapples, melons, and oranges. Most of the time, the fruits will be what is in season. A fruit dip, often located in the center of the tray, is included as well. The best fruit to include on a fruit tray is anything that can be neatly sliced or cubed such as melons, mangoes and pineapple, along with small fruit, such as cherries, grapes or berries. With so many fruits to choose from, it might help to use a theme, like tropical fruit, breakfast fruit or a harvest selection. If you use apples or pears, keep them from turning brown on the tray by treating them with lemon juice or store-bought natural treatment that can be sprayed on. Many people are allergic to strawberries, so if planning on purchasing a fruit tray or even creating one, consider keeping them in a separate container within the tray. Melon tends to “wilt” once cut, so use ice to keep it chilled if it will be sitting out for a while. 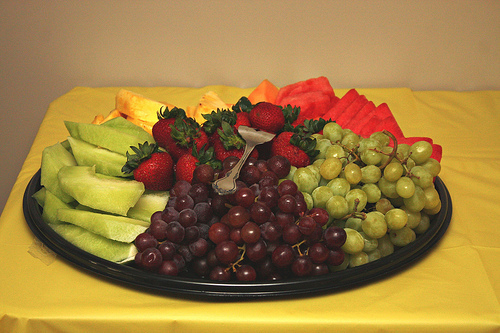 Keep the fruit tray covered until right before the event begins. Include yogurt based fruit dips or more indulgent chocolate or caramel sauces for guests to try with the fruit. You can use all parts of the fruit on the fruit tray, even the inedible parts. For example, the stems of strawberries or rinds of melons can be used to decorate parts of the tray. There are many great ideas and suggestions on websites such as Pinterest. Making the fruit tray or arrangement yourself instead of having it catered or buying a pre-made tray from the grocery store is a great way to save money. Look for the seasonal fruit to find the lowest prices and buy fruit like grapes and strawberries in bulk. Also, use less expensive fruit to fill out your tray. Chewonthatblog.com offers some tips on how to create an amazing fruit tray. One way to save money on the tray needed to serve the fruit tray is to make your own. If you purchase a watermelon, this can be cleaned out and used as a bowl. This is a very good accent to any party and is also cheaper since it gives you a place to store the fruit and provides fruit for a fruit salad.